Hans Christian Ørsted—also spelled Oersted—(Rudkøbing, August 14, 1777 – Copenhagen, March 9, 1851) was a Danish physicist and chemist. He is best known for his discovery of the influence of an electric current on the orientation of a compass needle (April 1820). In 1932 the name oersted was adopted for the physical unit of magnetic field strength |H| in the Gaussian system of units. As a student at Copenhagen University, in 1797, Hans Christian got a degree in pharmacy and received prizes for papers on aesthetics and chemistry; two years later he was awarded a doctorate for a dissertation on Kant’s philosophy. In 1801, Ørsted received a travel scholarship that enabled him to spend three years traveling in Europe. In Germany, he met Johann Wilhelm Ritter, a physicist. Their conversations drew Ørsted into the study of physics. He became a professor at the University of Copenhagen in 1806 and started his research on electric currents and acoustics. Under his guidance, the University developed a comprehensive physics and chemistry program and established new laboratories. Ørsted coined the now forgotten term "conflict of electricity" for the effect which takes place in he conductor and its surrounding space. Early 1820, Ørsted still professor of physics at the University of Copenhagen saw that a magnetic needle aligns itself perpendicular to a current-carrying wire fed by a Voltaic pile (the forerunner of the battery). This was the first evidence that electricity and magnetism are related. Until that time these two natural phenomena were seen as separate and unconnected. The same year Ørsted published his finding in the publication Experimenta circa effectum conflictus electrici in acum magneticam [Experiments on the effect: the conflict of electricity in the magnetic needle], which he distributed among European physicists. Ørsted did not try to cast his experimental result into a mathematical model, this was done soon after by Biot and Savart, Pierre-Simon Laplace, and most thoroughly by André-Marie Ampère. Around 1820 Ørsted also discovered piperine, one of the pungent components of pepper. Later (1825) he found how to prepare metallic aluminium. In 1824 Ørsted founded a society (Selskabet for Naturlærens Udbredelse) devoted to the spread of scientific knowledge among the general public. Since 1909 this society awards the H.C. Ørsted Gold Medal for outstanding contributions to Danish physical scientists. Ørsted was the founder of the Polytechnical Institute in Copenhagen, modeled after the École Polytechnique in Paris. This institute is now the Technical University of Denmark, where engineering students receive a scientifically founded education. Ørsted was the first director of this Institute (1829). 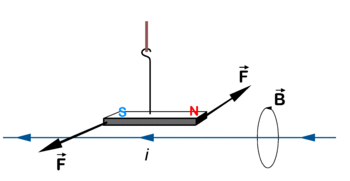 Ørsted's experiment: A bar magnet is hung above a wire carrying the direct current i. The magnetic field B is in the direction of the turn of a screw driven into the direction of i. The magnet experiences a torque, the south pole moves toward the reader, the north pole away from the reader. See Ampere's rule. Electricity and magnetism have been known since Antiquity. Rubbed amber was known to attract light objects, and lodestone (loadstone, magnetite) needles have been used as magnetic compasses since ca 1300 AD. However, the two phenomena, electricity and magnetism, were seen as unrelated. It required Alessandro Volta's invention of the battery ("Voltaic pile") before sustained electric currents of non-negligible strength could be generated. Soon after Volta's invention (during the spring of 1800), Ørsted noticed in April 1820 an effect of an electric current on a permanent magnet. François Arago demonstrated the discovery at the French Académie des Sciences (11 September 1820), which inspired Jean-Baptiste Biot and André-Marie Ampère to investigate the effect further. At a meeting of the Académie des Sciences on 30 October 1820, Biot and Savart announced that the magnetic force exerted by a long conductor on a magnetic pole falls off with the reciprocal of the distance and is orientated perpendicular to the wire. Although Ørsted himself could not have foreseen this, his very fundamental discovery led soon to the invention (basically by Michael Faraday) of the dynamo and the electric motor. The importance of these inventions cannot be exaggerated. To mention just one aspect of their importance: every western household today has a couple of dozen electromotors in and around the house. This page was last modified 11:22, 12 September 2013.